Wondering how to entertain the kids on a budget during this February half term? Here's our round-up of some of the best cheap and free family activities you can take part in. If you’re looking for cheap and free half-term family activities then you're in luck, as we have a whole load of them right here! Here's a look at some of the best budget-friendly half term days out available across the UK. In Edinburgh, the National Museum of Scotland is celebrating its new Ancient Egypt and East Asia galleries with a range of free events including dancers from Shanghai and the opportunity to build a pyramid (9-17 February). Down in London's Southbank, the Imagine Children's Festival is running 12 days of events, half of which is free (13 to 24 February). There's music, theatre, illustration, talks from award-winning authors Jacqueline Wilson and Malorie Blackman and of course Peppa Pig. If you're in Manchester, the Spinning Gate Shopping Centre has free kids events from 11am to 3pm from the 18 to 23 February. Or head to north Wales for Model Railway Show on the 27 and 28 February and 1 March. They'll be free rides on miniature steam engines and sounds and smells aplenty. Delighting Doctor Who and The Thick of It fans alike, Peter Capaldi will be making an appearance at Edinburgh's Capital Sci-Fi Con on Saturday 16th. It's worth turning up early on the day as tickets will be limited (adult £9.50, child £5.70 and family £24.70). The North East has plenty of events from the 16 to 24 February: you can learn to be a Roman soldier at Chesters Roman Fort and Museum (adult £7, child £4.20, family £18.20 - free for English Heritage members) or learn to be a butler at Belsay Hall (adult £9.50, child £5.70 and family £24.70). If you're in Manchester, check out Salford Quays where the Media City has planned a whole week of kids events, featuring everything from bugs to Tudors to comedy with minimal charges (£2 to £5). Londoners have a choice between two very different events. The London Puddle Jumping Championships (yes, it is a real thing) is taking place in The London Wetland Centre from the 16 to 24 February; you just pay admission (adult £11.70 / child £7.11 and family £31.99). Budding knights, meanwhile, should have a look at the Tower of London's Knight School, running every day between 16 and 24 February, with opportunities to dress up and even defend the tower from an attack. You only have to pay admission, which is a little pricey (adult 22.70, child £10.75, family £40.80), but we've found 2-for-1 tickets using National Rail's Days Out offer. Get a free £100 and access to a 5% regular savings account when you open a first direct current account. You might be surprised what's available on your doorstep. Car retailer Inchcape has put together an interactive map listing the UK's top attractions and how much entry costs (see below). Or venture further by train and get up to half-price tickets to top attractions through National Rail's Days Out offer (find out how to get the discount here). Voucher sites such as Vouchercloud can also help you save on tickets, with options for Legoland, Kew Gardens, Warwick Castle, Bristol Zoo and Liverpool FC's Anfield stadium, amongst others. If the weather disappoints, that doesn't mean your half term should. For a lazy start to the day, Vue cinemas host Mini Mornings every morning during the holidays. Both adult and child tickets are £2.49 for selected movies. Odeon offers something very similar, called Odeon Kids. Kids and adults can go every morning during the school holidays at an ever so slightly higher ticket price of £2.50. Cineworld also does Movie for Juniors where you and the kids can get in for £2.50, or £5.50 for new releases. Find out more about snagging bargain cinema tickets here. Head over to your local Tenpin from Monday to Friday and get a cracking School Holiday Special deal. If you book online and go before 5pm, kids can get one game of bowling and a burger meal for £8.70 and adults can get the same for £11.20. Deals vary between bowling alleys so check the Tenpin website before you go. Many of the cheap and free events mentioned above include arts and crafts workshops. Hobbycraft also runs free workshops for kids in some of its 89 UK stores over the weekends and during half term. Check if your local store is running one. Alternatively, stay in and pass on your own skills (think instruments, drawing etc) to the kids. If the weather holds up, get them outside for a spot of tennis. Clubs up and down the UK offer free weekly tennis coaching lessons in public parks and free ‘walk on and play’ in certain courts. The National Trust has a number of cycle routes for families too as well as some great walks including walks for little legs so that the young’uns don’t get too tired. Councils across the UK offer free swim programmes for certain residents, so check out your local council’s website to see if you or your children are eligible. There are free museums up and down the country just waiting to be explored, and many of them host special events for children during the break. If you fancy catching a show with your sprogs, check out Groupon and Wowcher for cheap tickets. There are plenty of cooking websites out there with budget recipes which can cost you as little as £1 per head. 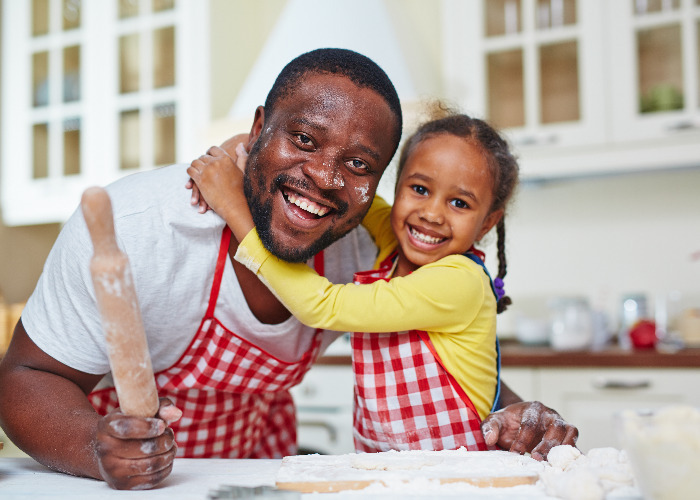 Our sister site loveFOOD has countless recipes for you to peruse, including Top 10 recipes for children and Top 10 easy and fun baking recipes. Happy cooking! Take it a step further: why not go out with the kids and pick your own fruit? Have a look at this list to pinpoint your nearest Pick Your Own (PYO) farm. You can guarantee that there’ll be some great offers available for families over the half term. You can find a load on websites like VoucherCodes with 50% off mains at Prezzo, 40% off mains at Bella Italia and a second meal for a £1 at Cafe Rouge. At Bella Italia, kids can eat for £1 when a full adult meal is bought. Spark your children’s curiosity with homemade science experiments. There are lots of wacky experiments you can try at home like creating your own tornado, fashioning a soap sculpture or growing edible crystals. You don’t even have to leave the kitchen. For more ideas, check out YouTube. You don’t have to go on a grand adventure to have a memorable day with the family. Find something you can all do together, like play a game or do a project which the whole family can get involved in. It can be as simple as grabbing some old scraps and getting crafty. There are thousands of projects available online, including ones that can be made using household junk. Put together a scavenger hunt in the garden using small knick-knacks or wrapped chocolates or take the hunt indoors if it’s raining. Rediscover old board and card games like chess or snap or seek out cheap new ones like Dobble. And if all else fails, raid the linen cupboard and make a giant blanket fort. Finally, if you're looking for even more ideas, take a look at these great suggestions from our sister site, loveEXPLORING.